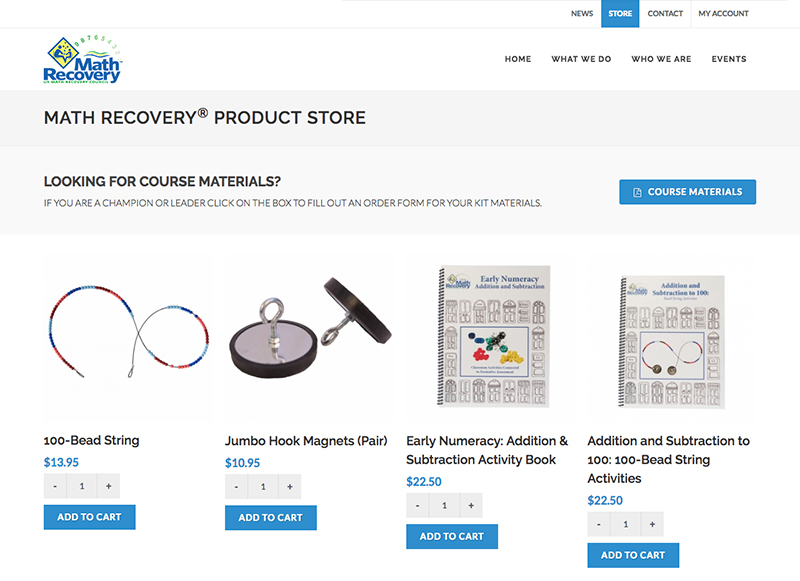 US Math Recovery Council® is pleased to announce the opening of our new online store. Educational Products will be ordered directly through our website beginning August 1, 2018. The online store will replace paper copies, email and phone orders. The store tab at the top of our website will bring you to Educational Product pictures and descriptions. Click further into each product to get more information. It is easy and quick to pick the quantity and "add to cart". We accept all major credit cards or you can upload a district purchase order as payment. AVMR Champions and MR Leaders will continue to order Course Kits through the proposal process. A kit order form can be found on the store page for information on pricing, etc. If you have any questions about the store process, please contact lisaj@mathrecovery.org.